Peel the brown outer part and knobby roots. No need to go crazy and get every tiny brown speck off. Cut into 1 inch or 1/2 inch cubes and place in sauce pan. Cover cubes with water and add juice of 1/2 of lemon. Partially cover pot and bring to a boil. Gently boil for 15-20 minutes or until tender when pierced with a skewer. 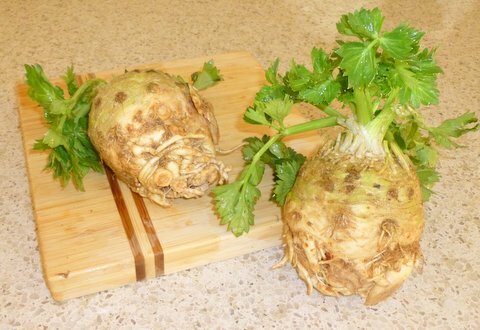 Drain celeriac, but reserve a few tablespoons of the cooking water. 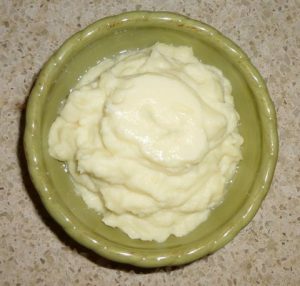 Place cooked celeriac in high-speed blender or food processor.